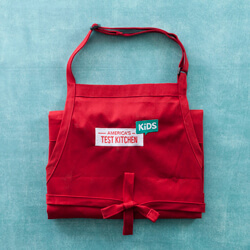 Start the young chefs in your life off right with recipes, equipment, and their very own version of the apron seen on our TV show. The Complete Cookbook for Young Chefs features 100+ recipes for everything from apps and salads to mains and sides (and even beverages), along with step-by-step photos of tips and techniques. 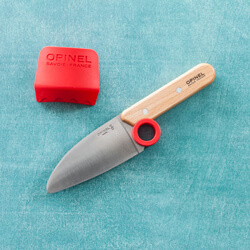 The Opinel vegetable peeler and chef’s knife are designed for beginning cooks’ smaller hands, and each rated highest in our tests with kids and our test cooks. Our old winner impressed our 8- and 9-year-old testers. Its wooden handle has a small, round finger hole that encourages kids to hold it safely and securely. The children said that it helped them get a “good grip” on the knife. It comes with a plastic finger guard, which shields the fingers on the hand holding the food. (We did not have children test the guard.) The knife's rounded tip protects kids from accidental nicks, and our testers liked that the blade “felt sharp” enough to cut through all foods with ease. Our young testers preferred this model's small wooden handle and additional finger ring. 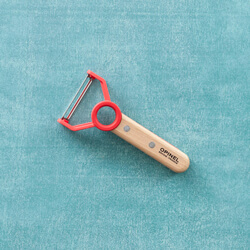 One said it “gave me a better grip, which meant I was more in control” and described it as “the most comfortable.” This model struggled slightly with thick apple skin, but it performed ably when we used it on potatoes and carrots.